To preserve the vanishing culture of sento, Japanese bath houses. Sento have always been more than just a place to wash. With people of all ages and walks of life brought together for a common purpose each evening, sento are very much a place for socializing among neighbors. With bathers spanning several generations, a culture of mutual respect is important, as is proper bathing etiquette. It’s a hard truth that the number of sento have been in steady decline. The city of Adachi in northeastern Tokyo has historically been home to many “downtown” neighborhoods (called shitamachi), but the laidback down-to-earth atmosphere of these once working-class areas has been threatened by changing lifestyles. Nevertheless, it’s our belief that the spirit of Tokyo’s shitamachi can hardly be captured better than by visiting a sento! Whether you are a tourist visiting Japan for the first time, a student studying here, or a long-time resident, we welcome you to try the unique experience of Japanese sento in Adachi! 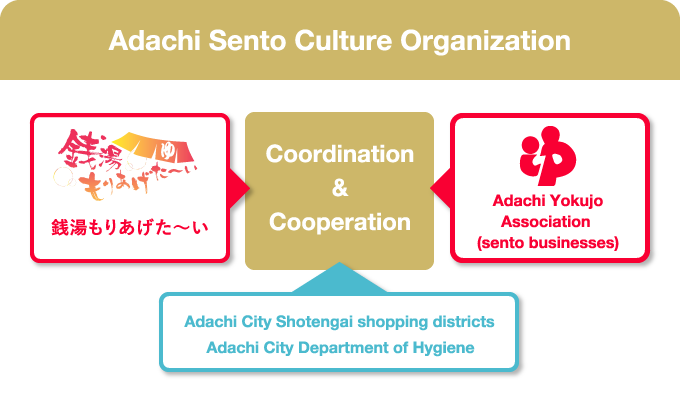 The Adachi Sento Culture Association was formed in the spring of 2013 in collaboration with the Adachi Yokujo Association and Sento Moriageta-i! Association, with the aim to reaffirm and promote the cultural and societal value of sento. The history and visitor information of each sento will be on our website, and we are planning to host guided tours around the Adachi area. We hope you will find the information here helpful and interesting, and we welcome you to join one of our tours! The logo next to our name shows a ring (representing a bath) with s-shaped columns of steam rising from the hot water. If you look closely, you’ll notice the steam forms an “A” for Adachi, and an “S” for Sento.